We share Communion on the first Sunday of every month. All who seek to lead a life following the way of Christ are welcome at the Lord’s Table. You do NOT have to be a member of this church or of the UCC. We offer Worship Workshop in the Spring for first graders in preparation of their first communion. We view First Communion as a rite of passage and a learning opportunity. 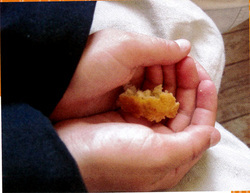 All children, regardless of age, are welcome at the Lord’s table.